At the same time as Pickfords was withdrawing from canal carriage, the LNWR was making plans to become involved with it. 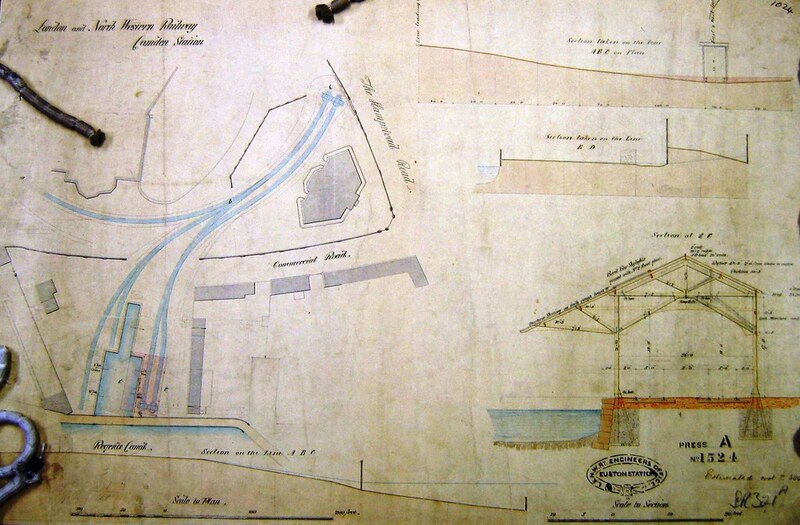 In January 1845 it agreed to purchase the freehold of Semple’s Wharf and some land at the rear, with a view to creating a transhipment depot. It wasted no time in building a bridge over the entrance to the basin, which was completed in 1846. The towpath, which formerly was diverted behind the docks into Commercial Road (or Commercial Place, now Camden Lock Place), now ran along the canal. The roving or diagonal bridge was constructed at the same time to carry the towpath to the south bank of the canal, as the LNWR could not bridge the other docks on the north side of Hampstead Road Lock. The sale of the freehold was finally completed in February 1847, allowing the LNWR to enlarge the basin and to provide a rail connection. A reversing spur was used to ramp wagons from railway level down to the basin. The basin was increased to some 150 ft (46 m) in length by a dock some 15 ft (5 m) wide and 60 ft (18 m) long. On the east side of the basin there was a single storey wooden shed and two cranes, with two more on the west side. This was completed in April 1848. The arrangement is shown in the picture. The alignment of the reversing spur is marked today by a skew arch under the North London Railway viaduct that was built shortly afterwards. This was the first of three phases of development of the site. 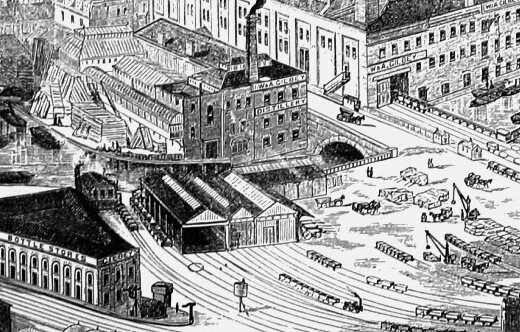 In 1854-6, as part of the major reconfiguration of the goods yard, the railway level was extended south and east along the canal from Southampton Bridge to beyond the east side of the Interchange Basin. The basin was rebuilt with the same canal frontage but a different alignment. It was increased in size to 210 ft (64 m) by 45 ft (14 m) to take six barges, and this basin remains. 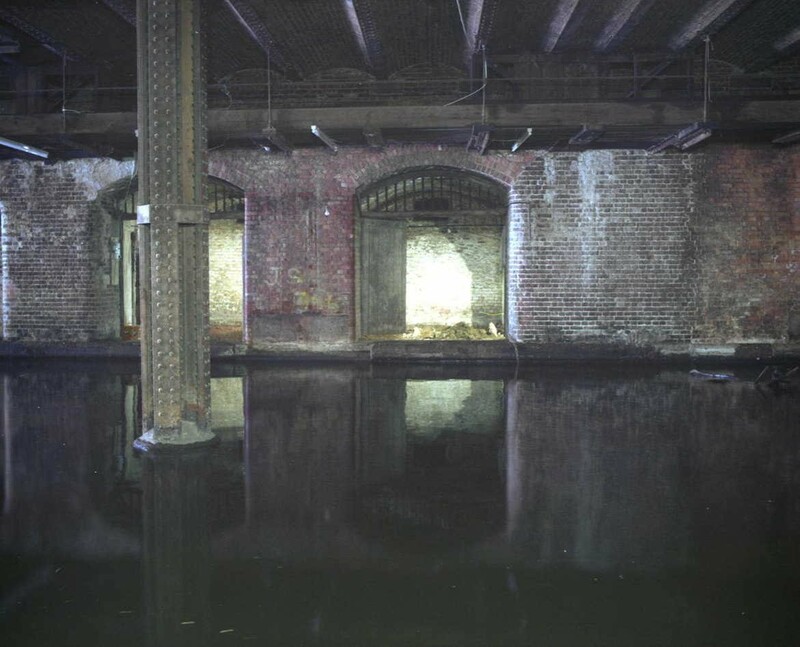 On the west side of the basin, the level was raised by a set of vaults that ran in an L-shape, both along the basin and along the canal. These were built to provide storage for Allsopps' ales and beers. The coke ovens had to be removed to allow this. On the east side, rail sidings were provided. An open-sided single storey shed was built in three spans: one broad (68 ft or 21 m) over the east quay and the dock, one narrower (34 ft or 10 m) over the west quay and another broad span (52 ft or 16m) over the vaulted area to the west. These spans are shown in the view of Gilbeys' facilities made in c1896, although this view diminishes (LNWR interchange warehouse) or omits altogether (LNWR offices) facilities not used by Gilbeys. Another partly open-sided wing of this single storey shed, with two roof spans, was built over the vaults running along the canal, but the west end of this was replaced in 1860 by two two-storey office blocks facing the Oval Road entrance to the goods yard. Between them was a wide entrance to the shed behind. These pavilion-like blocks, dating from 1860, had a smart, sub-italianate style with round-arched windows in two orders and dentil friezes below hipped roofs. Goods that entered the yard via Oval Road would be weighed, report their loads to the offices via speaker tubes, and instructed further. A number of later extensions were made, through to the 1900s, including being raised to three storeys in a compatible style, as this site developed into the main office block for the LNWR and its agents. The former railway offices were still standing in 2007 as part of this much larger building (see picture below). Some of their façades have been retained and modified in the new development at 30 Oval Road, as have portions of the façades of some of the later, multi-phased extensions. Before the recent work, the extended building presented a unified appearance to the canal, with the earlier vaults recognisable from their ventilation grilles, some of which have now been replaced in newer brickwork, following completion of work to the basement of 30 Oval Road. Drawings of what LNWR called the “new warehouse”, the third phase of development, date from 1901-02. The completion date is generally taken as 1905 and by 1906 Gilbeys were occupying the basement under the railway sidings on the east side. The aspect of the building at ground floor level was open on both east and west sides, beneath glazed canopies now removed, clearly revealing the massive octagonal columns. The floors were designed with wooden joists a foot deep touching each other, which provided both enormous loading capacity and fire resistance. The logistics of the building were substantially the same as the building it replaced, but with much greater storage on three upper floors. A single line of octagonal riveted columns runs down the middle of the dock. Internal cranes and hoists allowed goods to be transferred to and from barges through trapdoors in each floor. External hoists were also provided under hoods on the west side now long removed. The power house and hydraulic accumulator tower on the Gloucester Avenue side of the main line fed hydraulic power to the cranes and capstans. The picture shows the Interchange Basin (popularly known as “Dead Dog Hole”) from the west looking across the basin to the basement on the east side, with one of the columns in the centre. 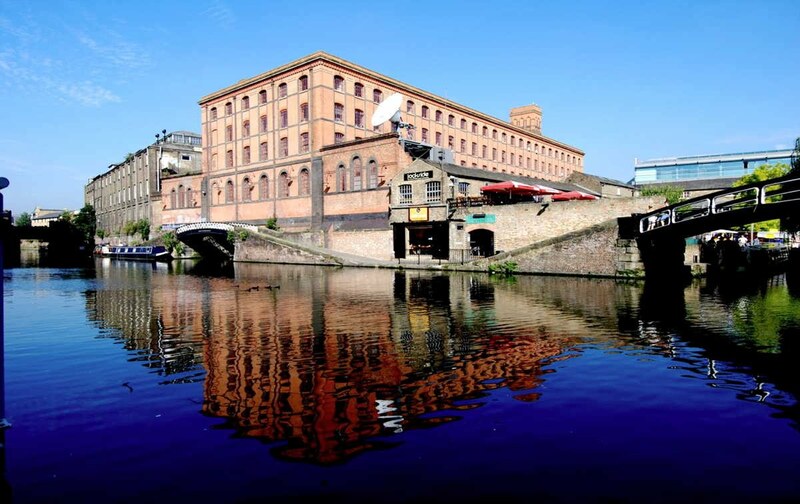 Jack Whitehead in The Growth of Camden Town: AD 1800-2000 maintains that The Interchange Building shows Camden’s past better than any other local building.